Every day we make choices. Coke or Pepsi? Save or spend? Stay or go? Whether mundane or life-altering, these choices define us and shape our lives. Sheena Iyengar asks the difficult questions about how and why we choose: Is the desire for choice innate or bound by culture? Why do we sometimes choose against our best interests? How much control do we really have over what we choose? Sheena Iyengar’s award-winning research reveals that the answers are surprising and profound. In our world of shifting political and cultural forces, technological revolution, and interconnected commerce, our decisions have far-reaching consequences. As an American, I take the ability to make my own choices for granted. There are so many options in all aspects of my life. From the moment I wake up, choices are abundant, whether trivial (blue or green sweater today?) or important (which job should I apply for?). Many factors underlie my choices, big and small, and even the number of choices can change how I feel about a decision. 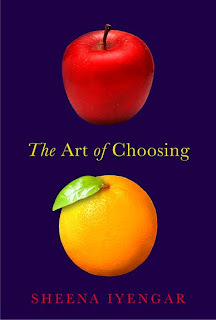 In The Art of Choosing, author Sheena Iyengar evaluates just how much choice the average person has, and just how it can affect all of our lives. She considers biopsychosocial and economic factors, advertising, and various other influences to show that a simple decision is not an independent product of our own minds. This book was like brain candy to me. Iyengar studied under Martin Seligman, who is one of my favorite psychologists for his work with positive psychology. Her work is a fine complement to his and expands some of his ideas, proving her to be a reputable force in her own right as a psychologist and author. Iyengar writes of her extensive research on the topic of choice and cites many other notable scientific experiments in a way that makes the findings compelling and completely relatable. There is none of the dry writing reminiscent of grad school in these pages! Nor is it pop-psychology, self-help fluff. All of the content is empirically based, as well as appealing and relevant to everyday life. Just as there is a delicate balance between too little choice and too much choice, Iyengar successfully navigates the balance between scientific and fascinating. I suggested this book to my favorite Positive Psychology professor at my alma mater, and I recommend it to all of you! These opinions are my own. I was sent a copy of this book by the publisher. No other compensation was received.